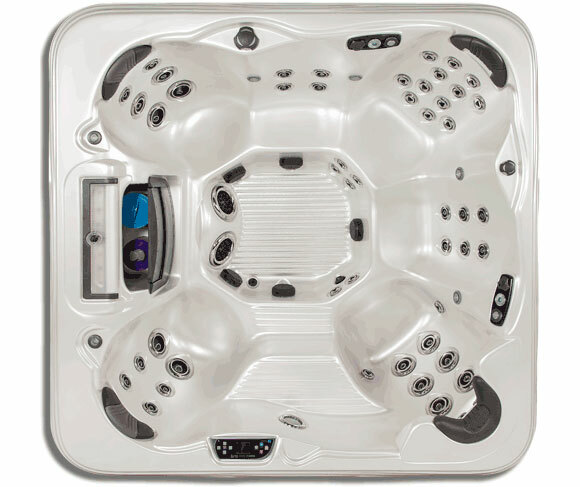 Island Elite Spas are Powered with DirectFlow Technology. The two Captain Seats allow you to control water pressure to your own preference creating the ultimate personalized hydrotherapy option. Allow the spa user to control the level of massage pressure by conveniently adjusting the spa-side control. The dashboard layout of spa controls makes it easy for users to control the spa while bathing. One soothing moment enjoying the Footblasters and you will agree that it is superior to any other foot massage. The Island’s leak-resistant plumbing is comprised of special high-quality flexpipe and hoses. Island Elite Spas come standard with maintenance free cabinets that are more durable and lighter than wood. The standard Island Spas Elite warranty comes standard with lifetime for structure, seven years for surface, five years for electrical and plumbing, two years for Kingwood cabinet. The addition of DynaStar LED, DynaPoint LED, DynaBrite LED lighting and Multicolored 10 LED systems to your spa illuminates the texture and detail of the spa’s interior, and the spa’s cabinet. This peaceful waterfall provides color therapy and the soothing sounds of falling water – creating a relaxing environment like no other. combines the Ozonator, Dynamic Injector, and the ProPure Mixing Chamber. All components work together to create an innovative water purification system. Use your smart phone to change your spa’s filtration and temperature settings.